A favorite plant in many Australian gardens is the Passion Fruit, really a vine, passion fruit or Passiflora edulis is an excellent fruiting plant for a sunny position. Originally from sub tropical areas of South America passion fruit vines can be grown easily as far south as Melbourne in the right conditions. In cooler climates they are often grown against fences or walls where they receive a fair amount of sun along with a little reflected warmth. Without doubt the best known varieties grown in Australia are the famous ‘Nelly Kelly’ a wonderful black fruiting variety that has provided essential ingredients for Pavlovas for many years. This is also the hardiest variety, it will survive light frosts (not heavy frosts) and grows well in Melbourne, Sydney and even in a protected position in Tasmania. The ‘Banana’ passionfruit would be next, elongated fruit and found in many home gardens. Both of these varieties seem well suited to cooler climates. The large fruiting ‘Panama Red’ is better suited to tropical to sub tropical climates. Passionfruit vines are readily available for sale from nurseries and garden centres across Australia. These are a dense foliage plant, so can also be used to grow along fences and trellises as a screening plant. Passion Fruit are all vigorous vines and heavy feeders, they climb using tendrils so a ‘wire trellis’ suits well for support. Avoid planting passionfruit where they will have competition around the root system if possible. Grown in an open sunny position or against a sunny wall or fence seems to be the favorite way in many Australian gardens. They do not like heavy soils, so clay soils will need to be amended, or perhaps raise the garden bed with compost and manure to improve drainage. In cooler climates, grow passionfruit against a fence or a wall in full sun. This will provide extra warmth, and being a solid barrier rather than just wires, it will help prevent cold winds from harming the plant. Most new vines take 2 – 3 years to be fully productive, many growers use poultry manure as fertiliser ( the pelletised stuff is excellent) and regular watering is essential. The best time to plant is in spring after the danger of frosts has passed. Prepare the soil well before planting as passionfruit are gross feeders. Choose a sunny protected position. Prepare the soil by digging in compost, aged cow manure and or sheep manure along with a good dose of blood and bone. You can also add some chicken manure, again do this well before planting to prevent root burn. Do this at least a month before planting. Water the area well and keep weed free. Make sure you have a trellis or other support in place. 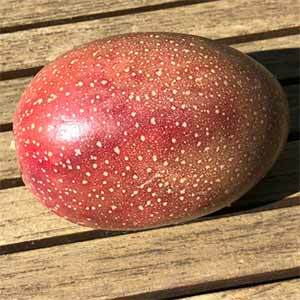 After the danger of frosts has passed in spring, you are ready to plant your passionfruit vine. If you are planted a grafted variety, remove any growth below the graft. As the plant grows, attatch it to the trellis and train it along the wires. Keep the water up to the vine through the first summer. Do not dig around the root system as this will encourage suckers. Mulch around the root system to help prevent weeds and retain a cool root run. The best time to apply fertilizer is in spring, remember to water well first. We suggest that you do not go to heavy with the fertilizer as this can cause bud drop. If you have kept the area around the root system weed free, rake gently to loosen the soil, but not so much as to disturb the roots. Disturbing the roots can cause suckers. Generally you will not need to prune for the first 2 – 3 years. After this regular pruning will improve fruiting and prolong the life of the vine. Pruning is more about thinning out the dense growth. Remove any dead or damaged growth. Thin the denser parts of the vine. The main stems should be left unpruned. Also over fertilizing as mentioned. Caused by a nutrient deficiency, usually lack iron, fertilize to remedy. Remember that in cold climates, or cold winters foliage will yellow during the winter. After a number of years ( 6 – 7) fruiting often seems to decline, best to replace the vine at this time. Some passionfruit varieties are more cold tolerant than others, for example ‘Sweetheart’ prefers warmer climates, Jumbo Gem can take a little cooler. Tropic as the name implies needs a sub tropical to tropical climate. Misty Gem is a versatile performer, while Yellow Fruiting passionfruit such as Panama Gold needs close to sub tropical at least. Generally the more common black variety is better suited to cooler climates, and of course the banana passionfruit grows well in colder areas as well.